This photo shows Peter Francisco Park in Newark's Ironbound. Every year, this tree at South Mountain Reservation in Millburn Township is decorated by local residents for the holidays. This photo shows the Newark Bears and Eagles Riverfront Stadium at sunrise with the Lower Manhattan skyline in the distance. The stadium will be demolished to make way for a new mixed-use neighborhood. This photo shows the Stickel Bridge and the NJ Transit Bridge in Newark at rush hour. This photo was taken on Main Street in Millburn. 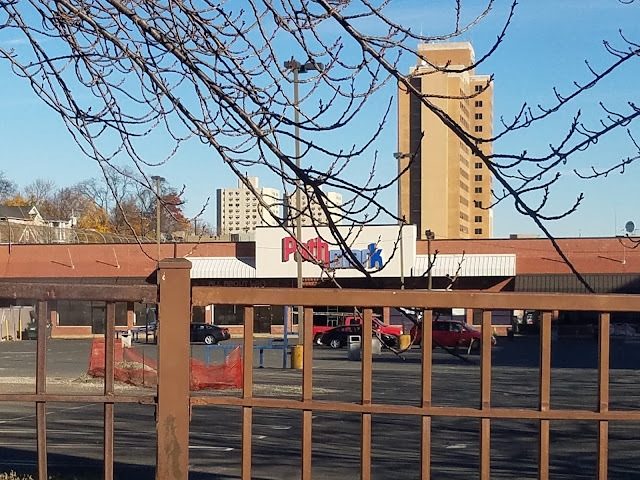 The former Pathmark building in Newark's Central Ward remains vacant, more than one year after the Bergen Street supermarket closed. The West Branch of the Rahway River passes under this building in Downtown Millburn. Newark, New Jersey: A bridge used by hundreds of commuter trains a week may be replaced. According to a legal notice issued Thursday, New Jersey Transit has issued a Request for Proposals (RFP) for "conceptutal design services for the replacement of the Undergrade Bridge 7.48", which is also known as the Newark Drawbridge, over the Passaic River. The agency is looking for proposals from qualified consulting firms with "related experience of a similar magnitude" that have "the intention of negotiating a contract with the organization whose qualifications and proposal best serves the needs of NJ Transit". A replacement study regarding the bridge was one of the projects affected by the Transportation Trust Fund shutdown earlier this year. The Newark Drawbridge connects Newark with Hudson County, and is used by NJ Transit's Montclair-Boonton and Morris and Essex Lines. Built in 1903, the bridge sits just south of the Route 280 Stickel Bridge. A preproposal conference will be held at NJ Transit's Newark headquarters on Wednesday, December 21st at 10:30am, according to the notice, and a site visit will be held later that morning at 11:30am. Proposals are due at the beginning of February, according to the agency website. Nutley, New Jersey: A new business will open soon in Nutley. The BGL is coming to 243 Washington Avenue, at the southwest corner of Grant Avenue, in the eastern part of the township. The restaurant, which will serve a variety of bagels and other breakfast and lunch items, will be open daily, according to the business Instagram account. It will be the third bagel shop in Nutley, joining Bagels Plus and Cafe and Nutley's Bagel Boy. The building that will soon contain The BGL was recently renovated, and the space was previously used for industrial purposes. Construction is underway on this new mixed-use development on Millburn Avenue in Downtown Millburn.